Early morning on Superbowl Sunday, the Mirrorcle Technologies team drew a sizeable crowd to the Photonics West MOEMS and Miniaturized Systems XVIII conference where the company’s Senior Electronics Engineer, Mr. Abhishek Kasturi presented a paper titled MEMS Mirror Module for Programmable Light System (Session 5, Paper 10931-21). The motivation for research into dynamic lighting solutions is based on increased demand, mainly from the automotive industry, for novel headlights, taillights, and so-called ‘courtesy lights’ in and around vehicles that allow for branding, customization and personalization as well as improved safety and awareness in potentially hazardous situations. Mirrorcle proposed a high-contrast, high-brightness programmable light system (“PLS”) enabled by its MEMS Mirror Module and the Vector Graphics Laser Projection (VGLP) Architecture for the next era of automotive lighting beyond LEDs and static laser-based solutions available today. VGLP-based dynamic laser headlights, for instance, allow the selective illumination or ‘darkening’ of specific areas, they can highlight lane markings and/or project symbols onto the road or garage walls, for example. Mirrorcle’s research and latest products address the need for automotive qualifiable, low-cost, compact, and high visibility laser projection systems for use in vehicle applications, as well as in many other uses including home, business and entertainment. The presentation sparked interest from academia as well as from a number of Tier1 automotive company attendees. Figure 1. 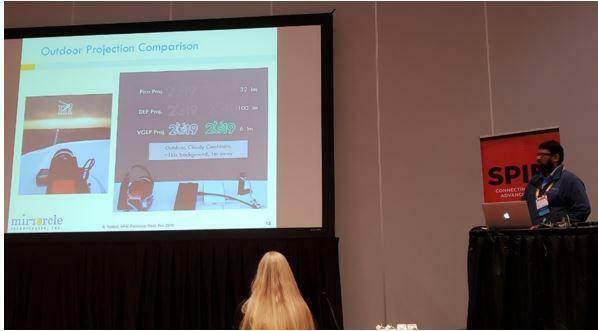 Senior Electronics Engineer Abhishek Kasturi presenting Mirrorcle’s latest research findings and Vector Graphics Laser Projection (VGLP) Architecture at Photonics West 2019 MOEMS and Miniaturized Systems XVIII conference. The paper, co-authored by Abhishek Kasturi, Veljko Milanović, Frank Hu, Hongjoo Kim, Derek Ho, and Daniel Lovell (all from Mirrorcle Technologies, Inc. (United States)), also highlighted the company’s latest mirror position and temperature sensing approaches based on sensing of modulated electrical signals on the respective grounds of the MEMS devices, e.g. for added safety in sensitive high-power applications. Mirrorcle’s MEMS Mirror Modules (MMM), Scan Modules and the pocket-sized ‘Playzer’ laser projectors were introduced as commercially available subsystems for solid-state LiDAR and programmable displays. The team explored multiple laser-based projectors in indoor and outdoor environments and compared brightness levels and contrast with respect to the background light. The proposed Vector Graphics Laser Projection (VGLP) Architecture meets the demand most effectively by taking advantage of high-bandwidth MEMS Mirrors to create the brightest and highest contrast vector graphics laser projection system on the market. Auspiciously, Sunday morning began with excitement in a different session on advances in blue sources and related lighting where researchers from BMW and SLD Laser, Hanafi et al., presented a co-authored paper on their latest work on, “High-brightness laser-based White light sources for automotive lighting applications”. The presentation comprehensively outlined all of the benefits of laser-based lighting and laser-phosphor sources, and useful static beam functions that the technology offers. In the final segment of the talk, authors announced the future possibilities of the technologies when dynamic functionality is added. Over 250 people in the audience with dozens standing around the room were informed about the fact that the future of dynamic and programmable light systems has arrived. That future is now a major step closer, as presented approximately one hour later by Mirrorcle in a neighboring session of the conference. Figure 2. Mirrorcle Technologies sponsored the Best Industry Paper and Best Student Paper Awards which were delivered to the winners by Conference Chairs.